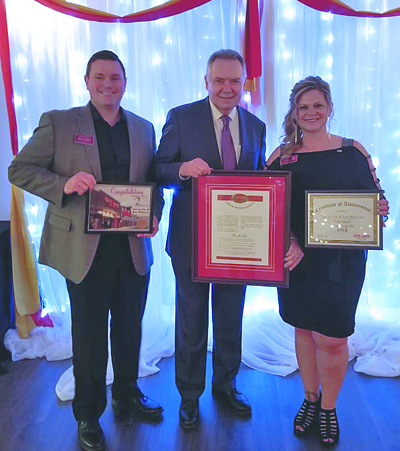 Crye-Leike Realtors’ current top producer for the Knoxville area, Teri Jo Fox, right, received the company’s prestigious Circle of Excellence Award for 2018 last month from company owner, Harold Crye, center. Also pictured is Eric Whitener, Fox’s husband and a Knox Fox team member. Teri Jo Fox is living proof that diamonds really are a girl’s best friend — especially when the recipient has a strong work ethic and an unmatched drive to succeed. The long-time Realtor earned Crye-Leike Realtors’ highest honor, its Circle of Excellence Award for 2018, along with an accompanying diamond-encrusted pin, which were presented last month by company owner Harold Crye. The award was the culmination of five years of hard work by Fox, who has been with Crye-Leike Realtor’s West Knoxville office for almost six years. She is only the second Knox County recipient of the award: the first was Diana Traylor, who now works in Fox’s office as its broker. Fox said she quickly set her sights on earning the prestigious award after coming on board with the company, even though it would require a long-term commitment, as award criteria starts with being a continuous five-year multi-million dollar producer. “Even if you made that four years in a row, then the next year didn’t meet the goal, you would have to start over,” she said. Other requirements include: industry and community service projects, professionalism, taking advanced real estate continuing education courses and achieving the CRS designation, ethics, loyalty; financial service and overall service to her clients and the real estate industry. Meeting the first goal was an easy one for Fox, who has built a solid reputation in the field since receiving her real estate license in 2007 and currently is Knoxville’s No. 1 Crye-Leike agent in sales. As far as industry and community service projects, Fox has served in many roles with the Knoxville Area Association of Realtors, including graduating from the first KAAR Leadership Class, and currently is serving as chairman of the KAAR’s Grievance Committee. The ethics requirement pertains to all-around behavior, not just real estate, Fox explained. One of her biggest cheerleaders has been her husband of five years, Eric Whitener, who is part of The Knox Fox Team at Crye-Leike. “He’s my favorite person,” she said — and the feeling must be mutual, as the two spend almost 100 percent of their time together between work and home.